Are you looking to relocate to Johannesburg? If you’re in the process of moving to Johannesburg and require a team of experts to transport your valuables, vehicles and even beloved pets, trust Stuttaford Van Lines to take all the stress out of the experience. With years of experience and a global reputation, Stuttaford Van Lines has helped families and businesses move to and from South Africa’s commercial hub for more than 150 years by offering tailor-made services to simplify each step of the relocation process. With our resources and organisational abilities we ensure your experience of moving to Johannesburg will be comfortable and easy one. Everyone knows how tiring and chaotic a move can be, but with a little planning and preparation, we’ll help you ensure that all your belongings are safely packed and transported to Johannesburg, the world’s largest city not situated on a river, lake or coastline. Your removal to Johannesburg should be an exciting journey, and with our team of experts taking care of all your moving requirements, you’ll have time to get acquainted to Jozi’s rich African culture. During the planning and preparation phase, we will allocate a single point of contact to keep you updated every step of the way, as well as to answer all of your questions. We have experienced consultants and analysts on hand to help you decide on all the logistics involved in moving, and provide specialised packing and transporting services for fragile and invaluable items – as well as anything else you can think of. We’re also one of the few removal companies in Johannesburg that offer assistance with home and school searches, and will gladly assist you in gathering the information needed to make important choices in unfamiliar territory. Stuttaford Van Lines boasts the largest fleet in Southern Africa and has branches and sales offices in every corner of the continent so, no matter where you’re coming from and going to, we’ve got the tools necessary to get your valuables there safely. 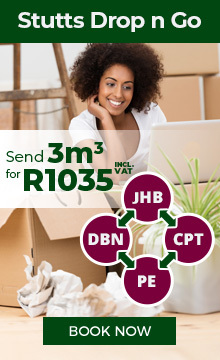 Speak to us today to find out more about our customisable services and, whether a young family or a large corporation, let us show you that moving to Johannesburg, this city build on Gold, is an experience to look forward to.